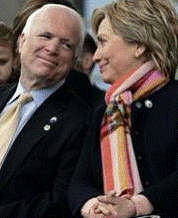 TheTownCrier: Support your candidate by stopping John McCain! TheTownCrier will not endorse a candidate in this primary, we'll leave that to the rest of you. AT this point, our concern is stopping the media's pick of John McCain, endorsed today by the N.Y. Times along with Hillary. THAT should motivate you to get the word out to those depending on the media for information. Unless we get very lucky, and he is allowed to display his hair trigger obnoxious temper we will be stuck with the worst candidate the GOP could offer up. Mark Steyn: (First they came for the Pigs) "Here's another news item out of Britain this week: A new version of "The Three Little Pigs" was turned down for some "excellence in education" award on the grounds that "the use of pigs raises cultural issues" and, as a result, the judges "had concerns for the Asian community" – i.e., Muslims. Non-Muslim Asians – Hindus and Buddhists – have no "concerns" about anthropomorphized pigs. This is now a recurring theme in British life. A while back, it was a local government council telling workers not to have knickknacks on their desks representing Winnie-the-Pooh's porcine sidekick, Piglet. As Martin Niemoller famously said, first they came for Piglet, and I did not speak out because I was not a Disney character and, if I was, I'm more of an Eeyore. So then they came for the Three Little Pigs, and Babe, and by the time I realized my country had turned into a 24/7 Looney Tunes it was too late, because there was no Porky Pig to stammer "Th-th-th-that's all, folks!" and bring the nightmare to an end. Just for the record, it's true that Muslims, like Jews, are not partial to bacon and sausages. But the Quran has nothing to say about cartoon pigs. Likewise, it is silent on the matter of whether one can name a teddy bear after Muhammad. What all these stories have in common is the excessivedeference to Islam. If "The Three Little Pigs" are verbotenwhen Muslims do not yet comprise 10 percent of the British population, what else will be on the blacklist by the time they're, say, 20 percent?"